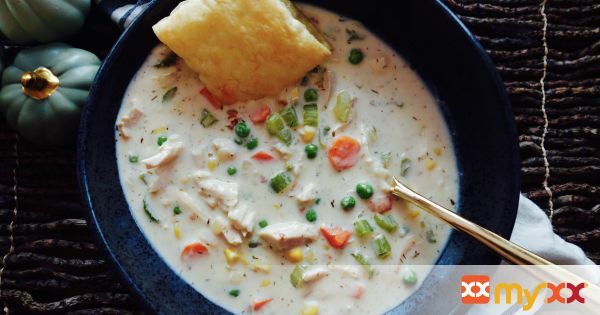 Creamy, chicken pot pie, in soup form. 6. Note: Not all chicken bases and bouillons are created equally. Be sure when you select one that you look at the amount of sodium in each teaspoon of granules. Some brands have double or even triple the amount of sodium than others. No matter which brand you choose, use the amount suggested on the label OR best suited to your tastes. Following the recipe exactly as written but using a different brand or style of bouillon or chicken base can result in an overly SALTY and otherwise inedible dish. You may substitute chicken broth for the chicken base/water combo, however, the soup it will not have the same rich chicken flavor. I definitely recommend using the chicken base which has a more concentrated chicken flavor.